I am obviously no poet but fortune favors the bold, so I present this shot at comedic poetry. I got the idea for this piece flying back from a recent trip. Amazing the dribble you will stoop to create when squeezed into a high altitude sardine can! I’m calling in sick today because I am not very well to do. 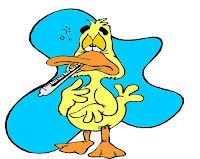 Dr. Aflack called and said all tests indicate bird flu. Boss man I am certain you are curious of my health and care. My symptoms range from bad to worse so say a silent prayer. My head is pounding from shotgun blasts and body aches from the frosty morning chill. My lips are chapped from the blowing wind and trigger finger itches from the ducks I plan to kill. My nose sniffles from the smell of gunpowder and eyes water from the glaring morning sun. My throat is raw from laughing but I swear I’m not having fun. As you can plainly see I have an avian affliction with only one viable cure. It requires time in a duck blind with family and friends of this I am sure. This apparently fowl predicament will have me out most of the week. But when I return, I promise to stop daydreaming about shooting ducks on the wing.